Copies network shares, files, folders and accounts including their security information (Discretionary Access Control List, System Access Control List, Owner and Group). Optionally the permissions of the destination can be inherited. Synchronizes source and destination, copying only files that have changed since the last synchronization run. Optionally deletes files that no longer exist at the source (as known as "lonely files"). Graphical user interface to run jobs interactively or to schedule them for later execution time. Real time synchronization to eliminate user down time during cut-over. 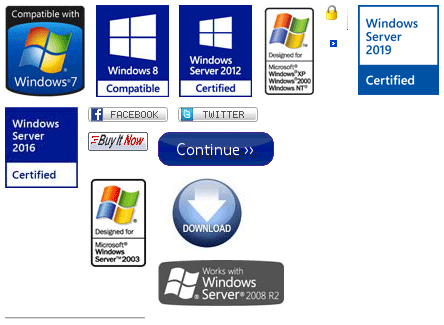 Migration of local and server based Windows® user profiles. Automatic translation of Windows® shortcuts (.LNK) files. Automatic update of most recently used file references in user profiles. Automatic update of persistent network connections stored in user profiles. Migration of Windows® reparse points (directory junctions and symbolic links). Migration of Windows® NTFS hard links. Migration of IIS/FTP site configurations from IIS 6.0 (Windows 2003) and newer to IIS 7.5 (Windows 2008 R2) and newer. Possibility to use the GUI to connect to a remote server that has CopyRight2 installed to operate the software from a centralized location such as a notebook. Besides of automatically copying user and group accounts contained in file or share permissions as needed, CopyRight2 has the possibility to selectively copy and synchronize user and groups accounts without copying file data or shares. Optionally copies and / or synchronizes user account passwords. Optionally allows the definition of time frames, causing the migration to stop when the maintenance window ends. Allows the definition of a maximum bandwidth in KB/s to limit the amount of bandwidth consumed by copy jobs. Supports DFS (Distributed File System) either clustered or non-clustered to migrate file shares while preserving the existing UNC namespace and automatically updating the corresponding DFS mapping. Additionally offers a command line interface (CLI) to provide a script based interface to existing processes or applications. Multi-threaded copy engine maximizing throughput by automatically optimizing itself depending on file characteristics. Continues where Microsoft Robocopy stops. Compresses or decompresses files while copying according to user settings. Migration of NTFS encrypted files preserving the encryption. Migration of client side caching settings (CSC) of network shares. Copies or changes the creation date of files and folders. Copies short file names to preserve 16-bit application compatibility. Can automatically compress old or rarely used files while copying. Filtering to exclude files from getting copied, depending on their creation time, change time or the last access time. Copies users, local groups, local group members, global groups and global group members. By default preserves user and group names during migrations. Optionally allows the definition of prefixes and suffixes for users, local groups, global groups and file shares to circumvent naming conflicts during server consolidations. Features a graphical user interface to optionally create a mapping table defining which users and groups in the source environment relate to which users and groups in the destination environment. Supports all possible migration scenarios in the same or between different domains (domain member to domain member, domain controller to domain controller, domain member to domain controller, domain controller to domain member). Modifications to file security or file attributes can be applied without actually moving any data to ReACL file permissions (replace), AddACL (add) or DeACL (remove/cleanup) specific accounts from permissions. Supports migrations utilizing the Windows® sidHistory feature. Supports non domain computers running in workgroup mode as source or destination as well. Even files that are "normally" not accessible can be copied in the same way it is done by Windows® backup features, allowing you to backup all your files, even those where the access control list (ACL) would deny access. Supports the Windows® shadow copy feature to copy files that are locked and in use. Creates an error log file. Optionally creates an entry within the Windows® event log on success or failure. Optionally sends a result email in case of success or failure including the log file as attachment. Offline migrations of files, file shares, groups and users (including passwords) allowing the migration of servers between disjoint networks. Import of Samba PDBEdit exports to import user account passwords from Linux. Migration of Active Directory user accounts, contacts, security groups and distribution lists (local, global, universal). Migration of Active Directory OUs and container structures. Migration of Active Directory object’s permissions or possibility to inherit permissions from the destination OU/container. Object class specific definition of Active Directory attributes to migrate (include / exclude / all class attributes). ActiveScript support to transform user, group and contact attributes (called for each object migrated) during migration from source to destination. Possibility to define scripts executing at the beginning and/or the completion of executed copy jobs. Exclude specific user or group accounts from the migration. Specify Active Directory accounts to migrate by using an LDAP query filter.